Even non-musicians and beginning enthusiasts can collect, organize, mix and mash up, and create new music using today's inexpensive and accessible software tools, such as the Sony Creative Software tools -- ACID Music Studio for music creation and mixing, and Sound Forge Audio Studio for audio recording, editing, and encoding. Sony ACID Music Studio 7 spans music recording, mixing, loop-based creation, and MIDI processing. It's for people creating original music using loops or recording vocals, instruments, or using MIDI -- like DJs and remix artists, home recording studios and musicians, video and multimedia producers, podcast and streaming media creators, educators, trainers, and presenters. Sony Sound Forge Audio Studio 9 is focused on the end-to-end audio editing -- recording, editing / restoration, encoding, and mastering. It includes interactive Show Me How tutorials to help step though leaning new tasks. Or step up to a higher-end professional high-end audio production toolset like Adobe Audition 3, through the full workflow of recording, mixing, editing, and mastering audio. Audition includes waveform editing of single clips, multi-track mixing, looping, MIDI, with extensive effects and tools for audio restoration and enhancement. I love flash drives for carrying data files, saving photos, and quick backups when travelling. But for long trips, and especially when I'm shooting video, it's definitely worth bringing along a portable hard drive for the much greater storage and faster transfer rates. For example, check out the LaCie product line for a nice selection of colorful and fun designs, to find your preferred capacity and size, using hard drives that are only 1.3" to 1.8" to 2.5" around. Each has built-in USB connectors with short cables that also power the drive. 30 GB $109, 40 GB $139. 1.3" drive, 3.34 x 2.16 x 0.23 in., 2.1 oz. 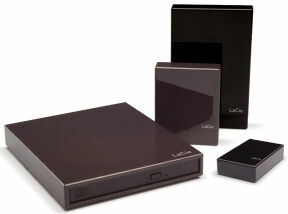 The LaCie Little Disk, designed by Sam Hecht, has several models that share the same clean design, black with glossy finish, with a removable end cap to access the extractable USB connector. The smallest Little Disk 30 / 40 GB uses a 1.3" drive to provide up to 40 GB of storage in a box that you can wrap in your fist. 2.64 x 1.69 x .67 in., 3 oz. Or double the size with the LaCie Little Disk 60 GB to move up to a 1.8" drive with 60 GB, still in the same price range. Or double the size, and weight, again (but with about the same thickness) with the LaCie Little Disk, 80 - 320 to use a 2.5" drive, offering serious capacities of 80 up to an impressive 320 GB -- starting at $80 and up to only $159. 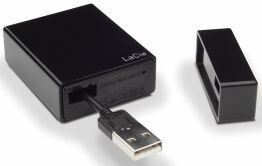 This larger size is also available with dual USB / Firewire (1394) interfaces. 3.15 x 2.52 x.71 in., 4.44 oz. 5.08 x 3.19 x.71 in., 6.88 oz. You still can't beat flash drives for their tiny size and ruggedness. But hard drives offer significantly more capacity at similar prices, and better performance. High-performance flash drives from companies like SanDisk offer read speeds around 15 - 25 MB/sec and write speeds around 10 - 18 MB/sec. In comparison, the Little Disk hard drives spin at 3600 to 5400 rpm, with burst transfer rates up to 30 - 35 MB/sec. 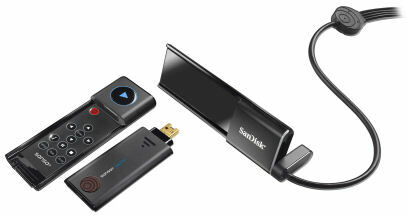 SanDisk has made a nice business expanding from its roots in flash memory with its SanDisk Sansa line of MP3 music and now video players. With lower prices for larger capacity, it's quite feasible to use memory-based players for video clips -- like the Apple iPod nano, with 4 GB for $149 and 8 GB for $199, playing 340 x 240 videos on a 2-inch screen in an amazingly thin design. Meanwhile, SanDisk has developed a common look across the Sansa line, with clean black designs with rounded edges and blue highlights -- including a thumbwheel controller framed by a glowing blue circle. The older Sansa e200 from way back in 2006 has been joined by the larger-capacity Sansa View and the new smaller Sansa Fuze. The new players are thinner, with a simpler thumbwheel and button, and support higher-capacity microSDHC cards. The View's screen has a portrait layout, great for scrolling though long menus when you have a large library of clips or lots of photo thumbnails, and with plenty of room to show song information with the album art. But when you display photos and videos the screen flips to landscape orientation so you can hold the player on its side for wide-screen images -- and the backlit button icons cleverly switch orientation to match. These players all include a built-in microphone, FM tuner, and voice/FM recorder. And they all include a card slot for additional removable storage --1 or 2 GB microSD cards ($19 and $29), plus the newer players add 4 to 8 GB with the new microSDHC cards ($49 and $139). The newer players directly support JPEG photos; various forms of MPEG-4 video; and MP3, WMA, secure WMA, WAV, and Audible audio; plus subscription music from sources including Rhapsody. The Sansa View also plays H.264 and WMV videos. While the older e200 used the Sansa Media Converter application to transfer photos and videos, you can transfer media to the View by simple drag and drop (if already in supported formats), or through media management software including Windows Media Player (to include album art and convert formats as needed). 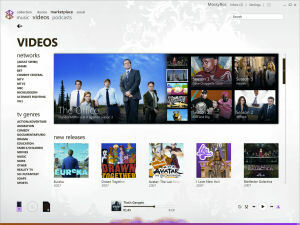 Microsoft has announced new software features and content for the Zune online store, music community, and Zune Pass monthly subscription service. The Zune video store is expanding to include downloads of more than 800 episodes of popular television shows that can be downloaded and synced to a Zune device. The TV shows, from sources including Comedy Central, MTV, NBC Universal, Nickelodeon, Starz, Turner, Ultimate Fighting Championship and VH1, are priced at launch at 160 Microsoft Points per episode (approximately $1.99). The Zune online store now offers more than 3.5 million tracks, two-thirds of which are available in pure MP3 format, 800 television shows, 4,800 music videos and 3,500 audio and video podcasts. The “Zune Social” music community Web site has had more than two million users join in its first five months, so music fans can discover new music, browse each others’ playlists, and comment on their discoveries and tastes. Members of the Zune online music community get a free, customizable Zune Card, a playlist which automatically reflects the songs played on a Zune player or Zune PC software. Previously, this only resided on the Web, but now has become portable. Consumers with the Zune Pass subscription now have the ability to take what their friends are listening to from the Zune music community on the go via Zune Card personal playlists. The Zune Pass subscription allows access to millions of tracks for $14.99 per month. The new updates to the Zune online music community include drag and drop syncing of Zune Cards to a Zune device -- subscribers get the full tracks on their Zune, while nonsubscribers have full album information and artwork. There are also social networking updates for sharing and searching Zune music community profiles, posting artist and albums reviews, earning reputation badges, and connecting via Windows Live. Zune Pass subscribers can set up automatic, real-time feeds of the music their friends are listening to. The Zune software also has been updated based on customer feedback. Users now can browse their video collection by genre and series, edit track or album information quickly via multi-select and drag-and-drop, sort by genre, sync to multiple Zune players simultaneously, and enjoy gapless playback both on their Zune device and in the Zune software. CyberLink has released the latest version of its well-known DVD player software, CyberLink PowerDVD 8. As you might expect, this new release adds support for the latest buzzwords in high-def video and audio formats, including Blu-ray Disk playback -- with an online patch to support the full Blu-ray Disc Profile 2 (BD-Live), with picture-in-picture display, networking, and advanced interactivity. Plus there's AVCHD and MPEG-2 HD video, and HD audio up to 7.1 channels with Dolby Digital Plus, Dolby TrueHD, and DTS-HD. However, the DVD player market is getting rather mature, as these applications are already well-refined for DVD and even general-purpose media playback. PowerDVD supports scads of media formats, provides fun options for video and audio enhancement, and offers helpful features including power-saving playback for notebooks, frame capture, and bookmarking for favorite scenes. What more could it do? So the next step for CyberLink was to go beyond playback features, and instead augment PowerDVD to enhance the overall movie experience by taking advantage of your computer's storage and Internet connectivity. After all, when you pop in an audio CD on your computer, it automatically looks up the album and artist information, and helps you organize and manage your entire collection -- why not the same for movies? So CyberLink developed the MoovieLive.com website to store and sync shared movie information with PowerDVD. When you play a DVD, PowerDVD downloads and displays Movie Information, which you also can edit and update with your personal ratings and reviews. As you watch DVDs, PowerDVD also updates the list of your personal Movie Collection. You can share your collection (like a playlist of favorite songs), and add other movies that you're interested in from MoovieLive. You also can get creative with Movie Remix -- mash up scenes from a movie and then add your own creative animated graphics and subtitle text overlays, plus audio clips and voice-overs. And, of course, you can upload and share your remixes on MoovieLive, and download remixes that others have posted -- though since the remix references the movie, you can only play them for DVDs that you own. MoovieLive is a great idea for the next step in watching DVDs -- taking advantage of the local computer and the wider Internet to enhance the movie-watching experience. However, this initial implementation in PowerDVD 8 is frustrating because the online movie database is only generated by PowerDVD users -- CyberLink did not link the site into a pre-existing DVD database to automatically load movie information. So until the population of users grows significantly, you can type in database fields yourself, or rely on partial uploads you may find from other users. 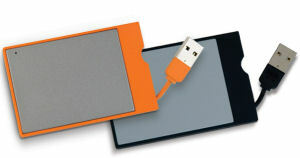 USB is not just about data connections any more -- it's also becoming the standard way to power up your portable devices as well. When you plug in to your computer to sync with a MP3 player or PDA, you're also feeding power over the same cable to recharge your device. Some portable devices now even don't bother to include a wall charger in the box -- instead they include a USB cable and a USB wall adapter. This trend makes it a lot easier to travel with multiple devices, since you don't need to bring a separate custom wall charger for each device. Instead, just pack up the USB data cables for your products that use custom interfaces (like the Apple iPod), and add a standard mini-USB cable for devices that just use the USB interface (or even micro USB for small devices like Bluetooth headsets). Yet while you then can charge these devices from your laptop when you are on the road, this still can get clumsy when you are dealing with multiple devices -- for example, when you need to charge a mobile phone and Bluetooth headset while you are using a USB mouse and storage drive. 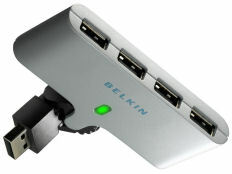 Again, Belkin comes to the rescue with two clever ideas to manage and power multiple USB devices (see previous post). The Belkin Swivel USB Hub splits one USB connection into 4 ports (all high-speed USB 2.0) -- so you can access and power multiple devices at the same ($29 list, around $19 retail). It also includes a power adapter if needed for power-hungry devices. Yes, you can find smaller hubs (but with an additional connecting cable), and larger hubs with more connectors -- but this Swivel Hub is travel sized, and has a handy two-way adjustable swivel connector. Rotate it sideways so you can still access additional USB connectors on your system, angle it up along the side of your system for easier access when you're inserting and removing devices, or fold it down to lie flat for storage. And for powering multiple devices, the Belkin Mini Surge Protector / USB Charger provides three AC outlets, plus two powered USB outlets, all with surge protection ($25 list, around $19 retail). The USB outlets are for power only -- they do not serve as a hub for transferring data. The product includes a mini-USB cable to charge many compatible devices, or else you can use the custom connector cable that came with other devices. 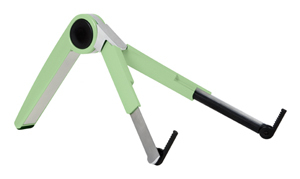 The hub also has a rotating plug which locks at each 90 degree position. See my Portable Power Accessories Gallery for other power systems, battery packs, and universal chargers that offer adapter tips for a wide variety of portable devices -- including cell phones, music players, cameras, and game machines -- so you can charge them all from USB power. Also see my Portable Peripherals and Accessories Gallery for more fun devices, organized by company. I'll be at the Philadelphia Area Computer Society this Saturday, May 17, for another presentation on Tech Trends and Toys. I'll have lots of fun gadgets to demo, especially portable consumer electronics devices, working from the trends and products showcased in my Digital Media Galleries. 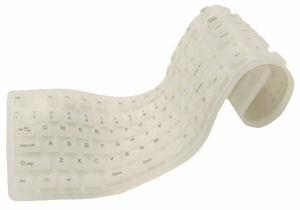 The Consumer Electronics Show in January displayed more than 20,000 new products - a lot of stuff! Doug Dixon will dig through the pile to highlight interesting new ideas, especially for home and personal entertainment. This will be an opportunity to understand developing trends in new technology, and to explore the latest options in fun new devices and gadgets. The NPD Group has released new market share numbers for portable MP3 / media players. The Apple iPod line continues to dominate the market at over 70%, and the SanDisk Sansa line remains a clear second at around 10%. Meanwhile, the Microsoft Zune gained one percentage point to 4%, as Creative declined further to 2%. See further analysis from Wired. Microsoft recently reported that it has sold 2 million Zune players since its launch in November 2006. In comparison, Apple reported that it has sold 10.6 million iPods in the first quarter of 2008, and iPhone sales were 1.7 million. See my Portable Media Players Gallery for details and comparisons of media players. Now in its eleventh year, the Streaming Media East 2008 show is being held this week again at the Hilton New York. It's a three-day event, with preconference workshops on Monday and two days of conference sessions and exhibits. The show fits well in the Hilton, feeling similar in size to the over 3,000 attendees last year, but up to some 65 exhibitors this year, requiring more space as some booths spilled out into the adjoining hallway. Dan Rayburn organized another great conference, with more than 100 speakers and 34 sessions (in three parallel tracks), with focus on major media companies and corporate users sharing their experiences with online media. In particular, well-known author Jan Ozer presented a great session comparing streaming codecs. He started with the results of his ongoing "unscientific" analysis of the video formats used on major websites, concluding that Adobe Flash has grown dramatically in broadcast from the previous parity with Microsoft Windows Media Video, but that WMV still has a lead in corporate use. Ozer first looked at implementations of H.264 / MPEG-4 AVC, concluding that the Main Concept codec (as used by Rhozet Carbon Coder, Sorenson Squeeze, and Adobe Premiere Pro and other Creative Suite applications) was best, followed by Dicas (Telestream Episode Pro), and again lagged by Apple (as in Final Cut Studio and Compressor), which seems to be standing still in H.264 quality. Ozer then compared the H.264, Microsoft VC-1 (Windows Media Video), and On2 VP6 codecs under low data rates, for both HD and SD content, evaluating still and motion quality and frame rate. He concluded that H.264 did best, especially keeping more detail. On2 VP6 also did well, especially with quieter motion backgrounds. And WM/VC-1 continued to lag, even dropping frames. Ozer also had a preview of the newly improved On2 VP6 codec, concluding that it provided better detail for HD and was quieter in terms of motion artifacts for SD -- though not the "as much as 40%" improvement promised by the press release. Ozer illustrated his presentation with frame captures comparing the results from each codec. And he concluded with a sneak peek at the raw data behind his analysis of the major streaming sizes, including video resolutions and data rates used by what he categorized as conservative, mid-range, and aggressive users of video. If you want to know more, including all the gory details on getting the best compression for streaming video, check out Ozer's new publication, Critical Skills for Streaming Producers -- a mixed-media DVD tutorial priced at $249. It includes a 340-page PDF book, plus 27 screencam tutorials demonstrating software tools, 9 tutorial videos, 75 sample videos demonstrating compression options, and 13 checklists. The book also includes the extensive market research data of video usage on major broadcast and corporate sites. Adobe has really opened up its development process by releasing public prereleases of its applications -- beta versions posted as free downloads for you to try out. The Adobe Labs site provides early access to evaluate new and emerging Adobe technologies and products. Adobe has now posted early looks at some of the new upgrades to its Create Suite 3 collection of professional for print, web, interactive, mobile, video, and film design. For video editors, check out the new Adobe Soundbooth for intuitive audio creation and enhancement, with multitrack support and enhanced editing workflow. For Web designers, there are betas of Adobe Dreamweaver for web design and Adobe Fireworks to prototype interactive designs. These integrate the common Adobe CS interface with tighter integration among the suite, provide deeper support for standards including CSS, and support Adobe AIR to author multiplatform desktop applications. And for all of us, there's a prerelease of Adobe Flash Player 10, with 3D animation, deeper support from Adobe effects and text technology, and enhanced performance. So go ahead and try these out -- for a limited time until they expire. Entries posted to Manifest Tech Blog in May 2008, listed from oldest to newest.